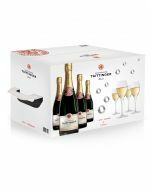 Taittinger Brut Prestige Rosé and two Taittinger branded flutes is presented within a gift box. 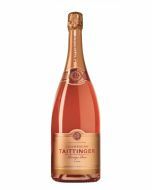 Brilliant pink shimmering and intense, with fine bubbles this rosé is both fresh and young with aromas of red fruit (freshly crushed wild raspberry, cherry and blackcurrant). 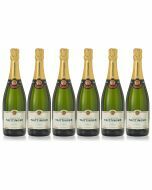 A velvet, smooth champagne of fine balance, and body - a subtle wine with flavours of fresh fruit. On the palate, this wine strikes a fi ne balance of velvety and full-bodied. The fl avours are reminiscent of fresh, crisp red fruits. The palate can be summed up in four words: lively, fruity, fresh and elegant, as only a rosé blend can be.